When the Dresden-based painters Adrian Zingg and Anton Graff hiked through the Elbe Sandstone Mountains in search of beautiful landscape scenes in the late 18th century, they felt reminded of the countryside of their native Switzerland. In their correspondence they thus wrote of “Saxon Switzerland” and this name quickly stuck. 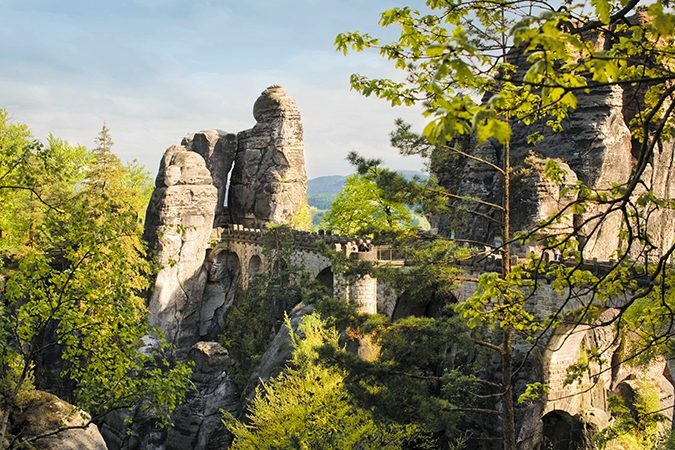 In the years after, the whole region soon became a tourist attraction, but especially a rock formation called the Bastei or “bastion”. The famous stone bridge built in 1851 is still standing. The panoramic restaurant offers a fantastic view over the Elbe Valley. And visitors wanting more peace can stay overnight in the Berghotel. Its historical part is the “Swiss House”, which would make even Adrian Zingg and Anton Graff feel at home. What is now perceived as mountains was once the bottom of a sea. 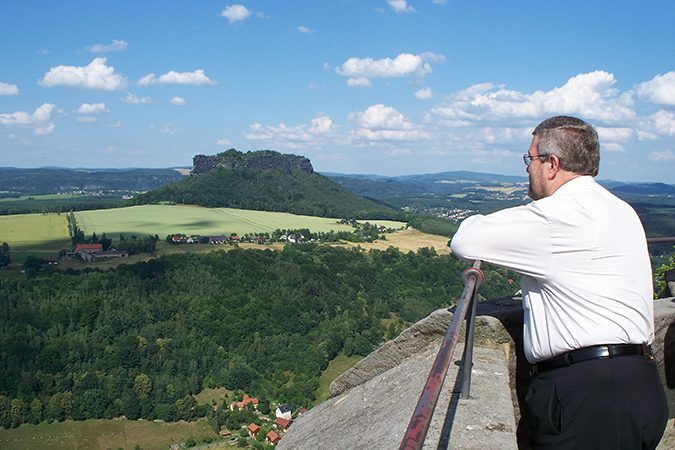 One of the mounts, Königstein, near the town of the same name, is crowned by a fortress which takes up the entire plateau. A walk along the fortress walls offers a panoramic view of the entire surroundings. In clear weather you can see as far as Dresden, the Ore Mountains and the Czech Republic. The fortress itself is an impressive military complex, which in the course of its 750-year history was never conquered by military force. Those who want to stay longer at the fortress today can find accommodation in the apartments of the pump house. There could be no more fitting venue for the “The Marksman”, Germany’s national opera by Carl Maria von Weber. 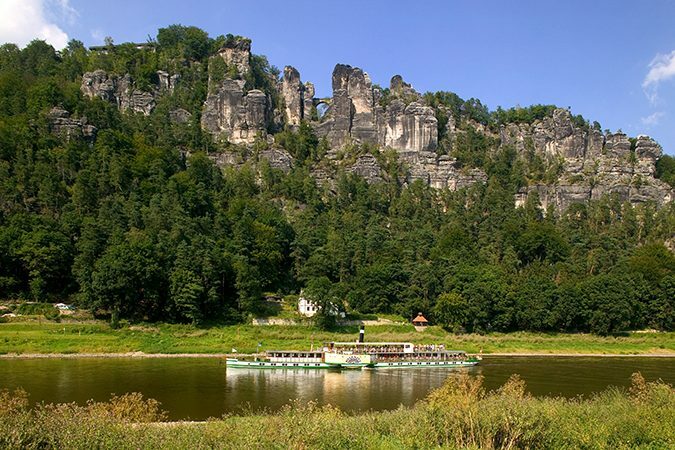 In a hollow at the top of the Wehlgrund Valley, surrounded by the dramatic rock formations of Saxon Switzerland National Park, stands the Rathen Open-Air Theater, often called Europe’s most beautiful outdoor theater. Besides “The marksman” there are regular performances of Engelbert Humperdinck’s “Hansel and Gretel” and Carl Orff’s “Carmina Burana”. 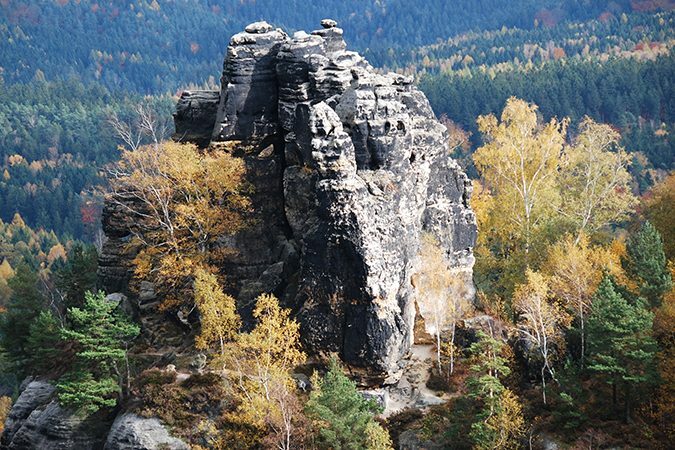 The Painters’ Path through Saxon Switzerland is not a normal hiking trail, but follows the footsteps of famous painters such as Caspar David Friedrich, Ludwig Richter and Adrian Zingg, whose works can be admired in the New Masters Picture Gallery in Dresden. Today’s hikers are still impressed by the wooded, wild and romantic gorges, the countless bizarre rock formations and the breathtaking views. Even today, one can meet artists who are inspired by the landscape. If you dare, you can even have expert supervision to become artistic yourself: painting classes here have a long tradition. The immense popularity of Saxon Switzerland with climbers led to more and more damage to the delicate sandstone rocks. This resulted in the introduction of the Saxon Climbing Regulations, first published in 1913, which prohibited artificial climbing aids and thereby any change to the rock surface. When Dresden-born Fritz Wiessner emigrated to the United States in 1929, he took the Saxon Climbing Regulations with him and used them to develop free climbing. Saxon Switzerland is still a paradise for climbers, with 20,000 climbs on 1,100 free-standing rocks.